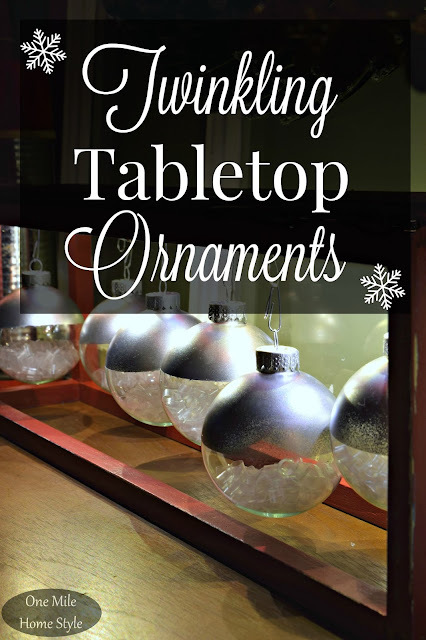 December was a busy month for crafty projects around here! We had another Create and Share Challenge this month and this one made us put out thinking caps on, for sure! If you are visiting from Casa Watkins or Uncookie Cutter, Welcome!! We could use any additional items we wanted to, but these items had to be a part of the finished product. I wanted something simple that would work nicely on the buffet, or as part of my tabletop decor, so I created a Twinkling Tabletop Ornament Display. 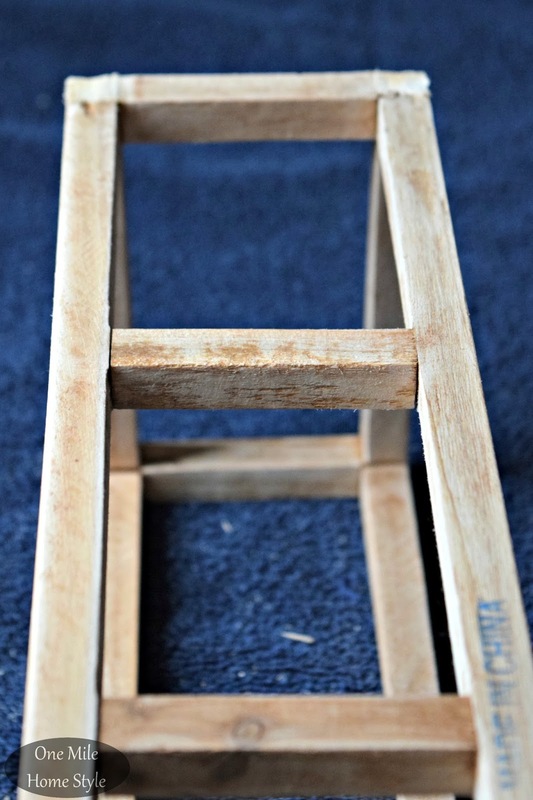 In order to get the look I wanted, I needed the bottom of the magazine rack to become the top, it also meant that I needed to cut the feet off so the top would be flat. Once the top was prepped, I glued a piece of scrap wood onto the top. While the glue was drying on the frame of my display box, I went to work on the ornament part of this project. 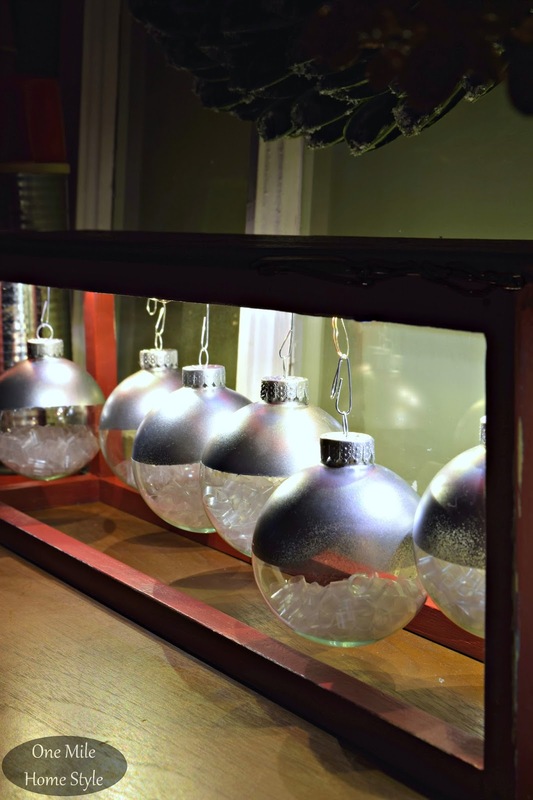 The first thing I wanted to do was somehow get an icy snow-like effect inside the ornaments, the clear straws were perfect for this! 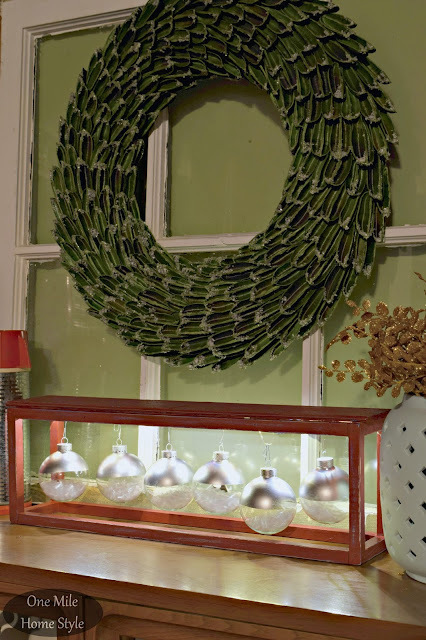 I cut the straws into small pieces and filled each ornament not quite half full. (I used the rest of the straws to make this awesome metallic snowflakes!!) Then I taped off the bottom half of the ornaments and gave them a couple of light coats of silver metallic spray paint. I totally forgot to take a picture of how I painted the frame (I know, I know), but painted the entire thing turquoise, and once that dried I added two coats of red on top. Then I sanded the edges to bring out a little of the blue and even some of the wood. It gives it a nice rustic look, and it helps hide any imperfections in the painting. Thanks to my inability to avoid the Target dollar spot, I had a string of battery powered LED twinkle lights. I attached to the underneath side of the top, and then I hung my snowy metallic ornaments from the light string. So twinkly!! 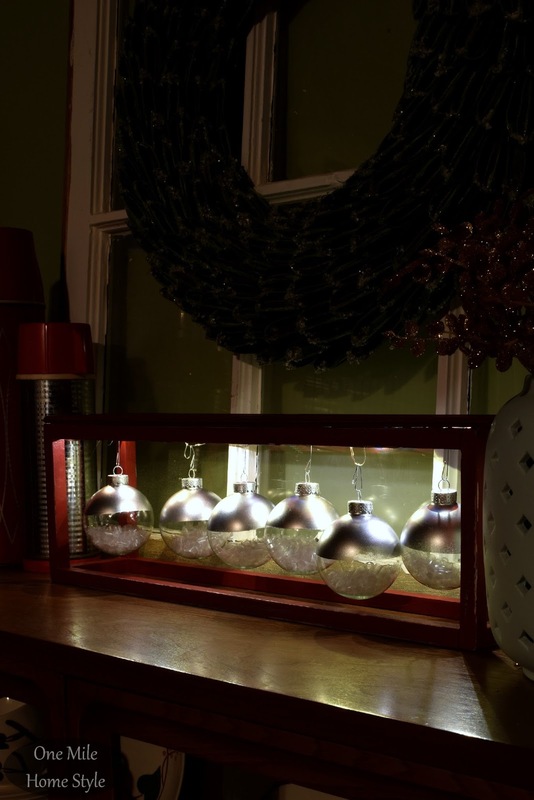 I love the glow the lights give off at night, and it's a fun little way to display ornaments too. 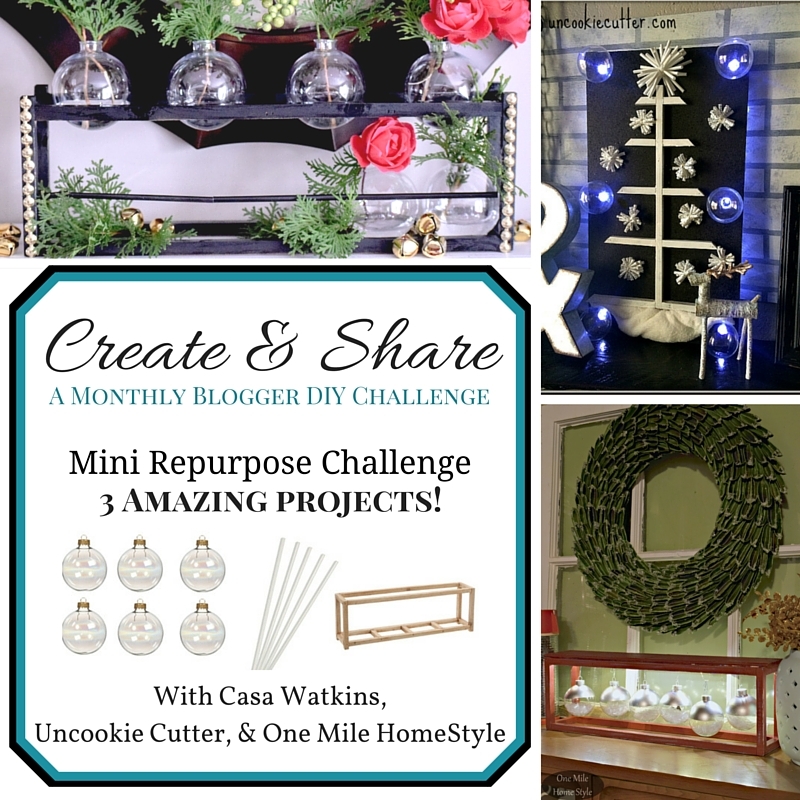 Now that you have seen my Twinkling Tabletop Ornament Display, head over to Casa Watkins to see Stephanie's display, and then check out April's artwork over at Uncookie Cutter! You will not be disappointed, these gals are so creative! I love this Stephanie! 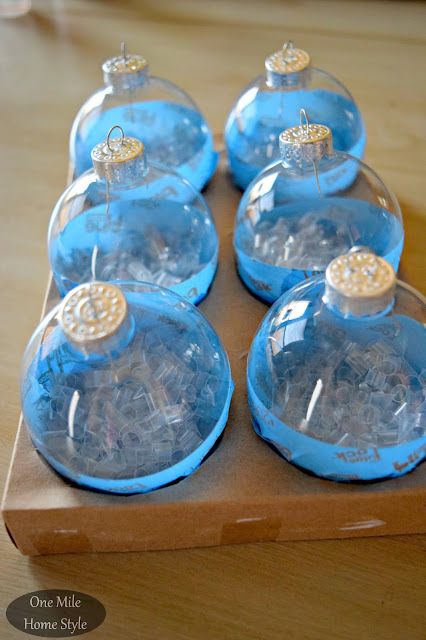 So pretty, I love the straws inside the ornaments. Very cool! Stephanie, I loved what you did with the items!! Very twinkly and bright! It makes a beautiful addition to Christmas decor. I'm thinking you could also change the straws into something else and use it for different times of the season. :) Pinned and shared. Ohmygosh I want this! Like I would totally buy this it's so pretty!